If you’ve followed me for the past few months, you know I’ve spent more than a little time highlighting the successes of Cleveland Browns GM John Dorsey. His ability to add marquee talent through both the draft and free agency served as one of the biggest reasons for Cleveland’s sudden turnaround. Considering the inept front offices we’ve watched run the Browns into the ground before Dorsey arrived, it stands to reason we’d get over-excited about his ability to understand how you’re supposed to build a team. Thanks to the latest rumors surrounding the Browns, we’re getting yet another example of how impressive his work has been in getting Cleveland going in the right direction. Per ProFootballTalk.com, the Browns have kicked off contract talks with left tackle Greg Robinson and wideout Breshad Perriman. Cleveland took a flier on each player last season, and likely didn’t expect re-signing either to be a priority once the year concluded. Considering each player’s backstory, it’s truly a statement to Dorsey’s eye for talent that most Cleveland fans are hearing this news and thinking, “well, yeah, you have to make sure those two don’t go anywhere.” In Perriman and Robinson, Dorsey found players whose respective careers were circling the drain, yet are now considered guys worth keeping around for a while. When Robinson and Perriman joined the Browns, neither was met with much fan-fare. Instead, many fans reacted to the news of their signings with a lot of doubt, and for good reason. Here the Browns were trying to replace left tackle and future Hall of Famer Joe Thomas, and they attempted to do so with a recognized bust in Robinson. Later in the year, Cleveland was dealing with depth issues at receiver, yet seemed to foolishly believe Perriman was a solution despite his noted struggles with dropped passes. While the team’s investment in both players was minimal, the idea either would play a crucial role seemed laughable. If anything, relying on two former first round picks who both flopped almost immediately seemed to be par for the course with the Browns. Clearly Dorsey knew something we didn’t, as neither Perriman nor Robinson looked anything like busts in Cleveland. When it comes to Perriman, he always had the tools to be a big play wideout. However, his size and speed were nullified by his inability to consistently catch the ball as a member of the Baltimore Ravens. Simply put, he was available for a reason when the Browns reached out to him midway through last season. Despite this, Perriman surprised everyone by suddenly becoming a consistent threat in Cleveland’s receiving corps. He quickly developed chemistry with quarterback Baker Mayfield, and ended up logging the highest yards per reception and catch percentage of his career. As for Robinson, most assumed he was simply a training camp tryout when the Browns signed him to a small deal last summer. Needless to say, very few were thrilled when it was announced he would be starting at left tackle in Week 9. This was right around the time concern began to arise regarding the team’s inability to keep Mayfield upright, as he was taking a beating on a weekly basis. It seemed lofty to assume Robinson — a former second-overall pick currently on his third team — would be any sort of a solution. Turns out we were wrong on that one, too. The amount of sacks Mayfield was taking dropped significantly in the back half of the season. While some credit is due to then-offensive coordinator Freddie Kitchens revitalizing the offense and getting the ball out quicker, Robinson still held his own. 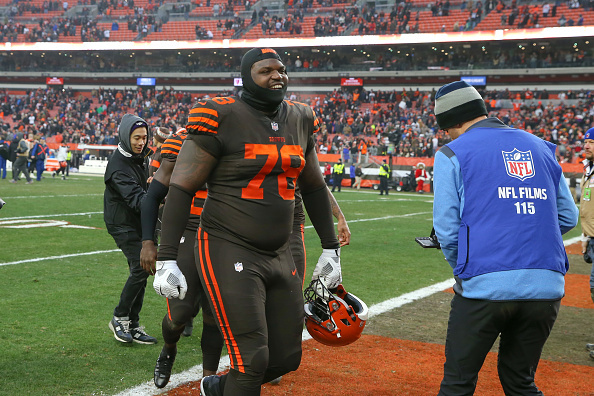 Very rarely was left tackle an area of weakness with the Browns, something you’d have never predicted based on Robinson’s history in the league. This isn’t to say Perriman and Robinson deserve Pro Bowl recognition or anything of that nature. Neither is being viewed as a cornerstone player, nor should they. That said, both came to Cleveland after being picked off the scrap heap. Knowing this, the fact the Browns are opening their offseason by working on new contracts for each is a hell of a statement. It’s also more proof Dorsey’s decision-making could be the key to turning Cleveland into a consistent contender.